Based in Manchester, New Hampshire, The Moore Center is a state and regional innovator with more than 50 years of experience in helping people become productive, fulfilled members of the community. 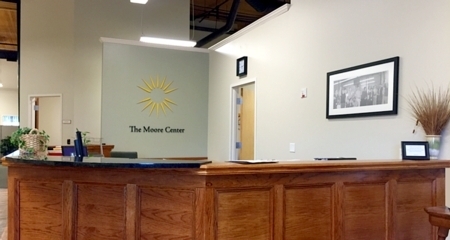 Working closely with each individual, The Moore Center identifies unique needs and creates individualized programs to enhance that person’s quality of life and that of the community as a whole. We are an award-winning leader recognized for providing high quality, cost-effective services with a personal, caring touch to individuals with developmental and intellectual disabilities and acquired brain disorders, as well as services to children and senior citizens and training for the human services workforce. Compassion, commitment and community provide the foundation for all of The Moore Center’s initiatives and inspire our primary goal: Creating opportunities for a good life. The Moore Center serves people with intellectual, developmental and personal challenges by creating opportunities for a good life. We envision a day when all people, despite their challenges, are fully engaged in their communities and living a good life. Honesty: We deal with each other in an open and sincere manner. Integrity: We act in a manner consistent with our words and beliefs, always honoring our commitments. Respect: We treat one another with kindness, courtesy, dignity and empathy. Diversity: We value and respect differences among all individuals. Accountability: We take fiscal and programmatic responsibility for our own words and actions. Innovation: We foster and encourage creativity in facilitating options.